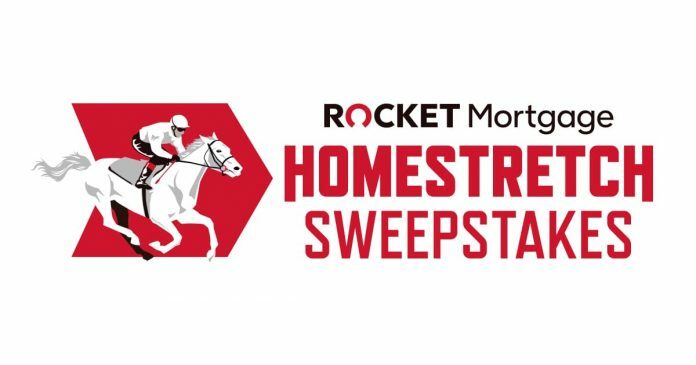 The Rocket Mortgage Homestretch Sweepstakes will award 20 First Prize winners a trip for two to attend the Kentucky Derby in style at Churchill Downs on May 4, 2019. Prior to the Kentucky Derby, each First Prize winner will be randomly assigned a Kentucky Derby race horse. The First Prize winner assigned to the horse that wins the Kentucky Derby will also win the Grand Prize of $250,000. During the Sweepstakes Period, you can enter the Sweepstakes by submitting the Sweepstakes registration form, available at www.homestretchsweepstakes.com. You must complete the Registration form with all required information to receive one (1) entry into the random drawing. If you are served a sponsored Sweepstakes ad on Facebook, you may click where indicated to complete the online entry form to receive one (1) entry into the random drawing. The Rocket Mortgage Homestretch Sweepstakes is open to legal residents of the fifty (50) United States (including the District of Columbia) who are twenty-one (21) years of age or older as of date of entry. The Sweepstakes Period begins on March 18, 2019 at 9:00:00 a.m. ET and ends on April 7, 2019 at 11:59:59 p.m. ET. A random drawing to select (20) First Prize winners will be conducted from among all eligible Entries received during the Sweepstakes Period, on or about April 9, 2019. (20) First Prizes: A 4-day/3-night trip for winner and one (1) travel companion from May 2, 2019 to May 5, 2019, to attend the Kentucky Oaks and the Kentucky Derby at Churchill Downs. (1) Grand Prize: $250,000 awarded in the form of a check in the name of the winner. A list of winners will be available on or after May 15, 2019 for a period of at least 30 days, by visiting www.homestretchsweepstakes.com. For complete details and official rules, visit www.homestretchsweepstakes.com.